Apple and Google are being accused of helping to 'enforce gender apartheid' in Saudi Arabia by offering an app on their platforms which allows men to track women and stop them leaving the country. 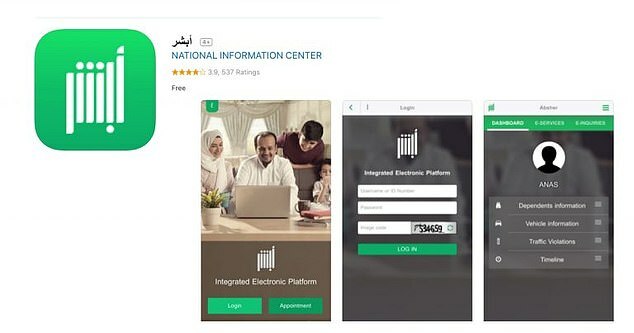 Absher is available on both the Google Play and iTunes store and is an app developed by the Saudi government which allows men to specify when and how women can cross Saudi borders - and will even alert them if they do so. Absher's travel 'featured' have been identified by activists and refugees as a major factor in the continued difficulty women have leaving Saudi Arabia. 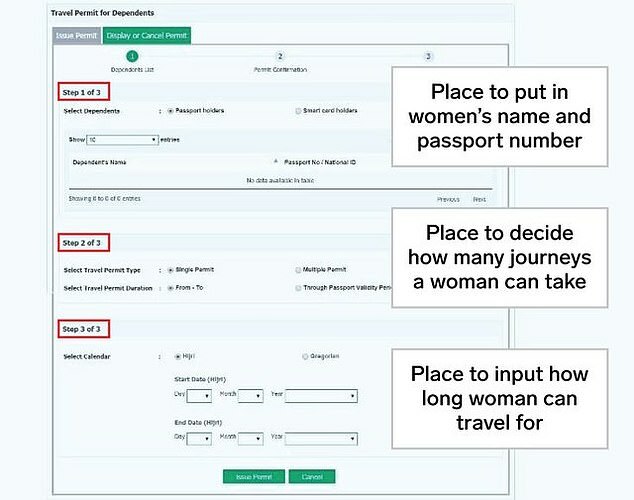 The app allows for guardians to state where women can go, for how long and which airports they're allowed to go to. Alerts are triggered if a woman leaves a certain area. It is one of the main reasons women have difficulty trying to flee Saudi Arabia and often get caught. Absher tips off male guardians and the fleeing women can be apprehended whil still withint the country. 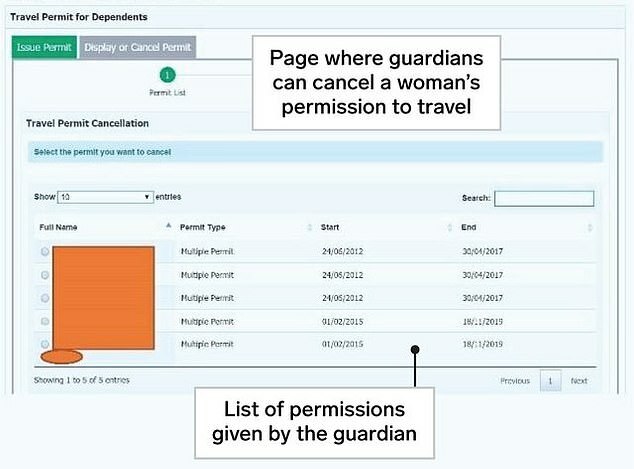 On another page the guardian can see easily which permissions are active and change them if needed. Human Rights Watch and Amnesty International have expressed concern about the app which have been downloaded from the Google and Apple stores more than one millions times. 'Apple and Google have rules against apps that facilitate threats and harassment. Apps like this one can facilitate human rights abuses, including discrimination against women,' Rothna Begum a Middle East researcher for Human Rights Watch told The Insider. Similarly, Dana Ahmed, a Saudi Arabia researcher for Amnesty International similarly condemned the app saying, 'SMS alerts were 'another example of how the Saudi Arabian government has produced tools to limit women's freedoms. The human rights organization has called on Apple and Google to accept that the app is being used to harm women, and demand changes to stop it happening in future. Apple and Google have so far yet to to comment. Hopefully there's a way to convince Apple and Google to ditch that program. I know the Daily FAIL is often garbage but they do mix the real with the shady. If this is a thing, it needs a big protest! I don't know about Apple, but Google doesn't prescreen programs added to the Play Store, and they tend not to do anything about programs on it unless they're notified. Hopefully this is good enough. My Blackview BV6000S smartphone has facility for two SIM cards: thus I have one network for everyone else: and another for only family & closest friends I've given my number to. Those with dual SIM slots are great that way. While my ruggedised model requires the back plate to be unscrewed to access the SIM slots & Micro-SD Card one, with all others it just needs a tray extraction tool to remove that which holds the SIM cards: an infinitely easier - certainly more discreet - method. Question: Are Blackview the only smartphone manufacturer whose products have that facility...?! Both do some measure of prescreening, though Google only really goes as far as an automated anti-malware scan to make sure no obvious hacks are being used that threaten a customer's phone. Apple goes further, but even in that, as far as I know they only make sure no software is being illegally copied and sold without license. Probably neither one had a real clue up front just how far this app goes. We'll see about their response in the next few weeks, but I don't hold out much hope that this app will be removed by either one, because after all . . . it's legal in Saudi Arabia. Need to get into their heads that women aren't property. Just a reminder that for all their posturing, Google and Apple are not actually progressive: they do not mind dictatorships policing their citizens or basically enslaving women. They are in it for the money. They may be more open to minorities, but only because they know they can make a buck off of them. This is their only incentive. "Women-tracking app that lets Saudi Arabian men track their wives is ALLOWED on Apple and Google stores and has been downloaded more than one million times "
Just put a microchip in them. Like we do for dogs. Why don't they turn off their phones? Or better yet, throw it in the back of a passing truck or leave it somewhere where it would be easily stolen. Then hop on the bus, Gus. My guess would be that they're unaware that they're being tracked. Perhaps don't even know about the existence of these apps. Well, Google is planning a version which would comply with Chinese censorship. If they really had MEN in Saudi Arabia, they wouldn't need to leash the women. Think of being the pitiful males in that society, knowing that their wives would never voluntarily choose to stay with them. I suspect the app is mostly used by parents to check where their kids mobile phones are. So they know where the kids are, and where to recover the phone from when the lose it, as they often do. As a parent, I find it a useful app. Though how you would stop it being abused, I don't know. There seems to be a place to enter her passport number, so theoretically any time she has to use it, it would alert the app. You can turn off your phone, but it’s a little harder to get a fake passport. I suspect the app is mostly used by parents to check where their kids mobile phones are. That's what I thought after reading the first paragraph, but then I noticed that it has a place to put passport information. Twelve year olds can't board planes anyway. This is not just a child tracker being abused. In Saudi Arabia women are not allowed out of the house without their owner unless they have written permission from that owner. up for school they won't be let in without showing that paper. They won't be hired for anything until they show the permission. They definitely won't be allowed to get on an airplane without showing the permission. This app tightens the noose even more. PS these laws were in effect in the ohees. They may have changed recently by the prince that's trying to "modernize" S.A.